"Yuriko. I can’t even begin to explain how happy I am. I walked into the ballroom and it was EXACTLY what I had wanted. You made my dreams come true. It was an amazing day and I am so grateful!! 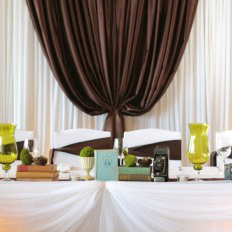 EVERYONE loved the decor and said that it was exactly me and my style. Lol so that was awesome. I wish I could have seen you and hugged you. At one point I saw you streak by. Lol and I say your husband. I almost grabbed him for a hug to pass on to you. 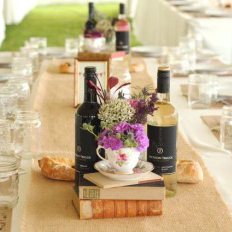 Oh the the favour table was my favourite. Well that’s a lie, it was ALL MY FAVOURITE!! You gave me the wedding I always wanted and I will forever be thinking of you. I cannot wait to see the photos!! from the bottom of my hear thank you." "There really are no words to describe the amazing work that Yuriko does. When Devon and I first started talking about our wedding, we quickly decided that we wanted it to have a warm ambience that was full of vintage charm, with lots of details that reflected both of us as individuals and as a couple – something we knew we couldn’t do on our own. 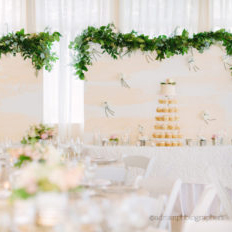 We kept stumbling upon beautiful Kelowna weddings on several wedding blogs – each one crediting Vintage Origami – and after seeing Yuriko’s work on her website, we knew that she would be able to make our vision (or lack there of!) a reality. What we didn’t know, was just how personalized and unique Yuriko’s creation would be; all done with genuine enthusiasm, grace, and artistry. Yuriko took all of our mix-mashed ideas, and created the most incredibly stunning scene for our ceremony and reception (which I definitely shed several tears over when I saw it for the first time! ); a hanging chandelier over where we said our vows, a special vintage car set up outside of our reception site with my dad in mind (which he still talks about! ), a secret cigar bar, and a giant stack of vintage suitcases (perfect for our travel theme!) were just some of the highlights that we are still reminiscing about, and that our family and friends are still gushing over! Yuriko, we don’t even know how to begin thanking you. Your talents far exceeded every expectation, hope, and dream that we had for our wedding day – such a wonderful way for us to start the next phase of our lives together!" Many thanks and much love to you, Yuriko!! "I don’t even know where to start! You did SUCH an incredible job with our decorations. The whole venue looked absolutely stunning. From the rooftop to the boardwalk, to the unbelievable reception space, it was a complete dream come true. I’m running out of words to describe how out-of-this world everything looked. 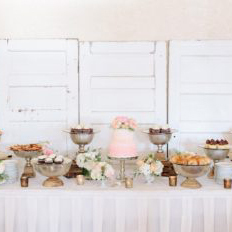 The dessert table — O. M. G.!!! I could go on all day…. haha. It was such a treat to know that all the decorations were in your trusty hands but what you put together far exceeded our expectations. 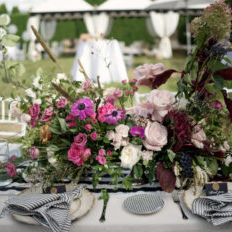 Even Troy was blown away by the gorgeous tablecloths, the mirrored table runner, and all the beautiful little details that added to such a special ambiance. I keep looking at photos and I can’t believe that was OUR wedding!! It looked like a magazine!" "Oh my gosh, i couldn’t believe my eyes when I walked into Summerhill! Everything was beyond the beautiful that I imagined you would create. I honestly just wanted to walk around and stare at everything instead of visiting with my guests. You killed it! I can’t put into words my feelings for all the hard work that you put into our wedding, nor my appreciation for who you are and how you operated throughout all of our interactions. You are a wonderful human and a ridiculously talented artist and business woman. Thank-you for everything!" "I challenge anyone to find a harder working team than you, Yuriko, and your sidekick (aka: amazing partner) Erik. It is clear you have amazing style and creativity just by looking at your business model and how everything you put a finger on has the ability to tell a new and unique story. But what people may not see is your kind-natured, hard-working personality behind the scenes. From 3am emails, to finding times to Skype as we communicate halfway across the world, to coming to set up the altar and telling me to “just sit back and relax”, you just make everything so easy in the chaos of planning a wedding. 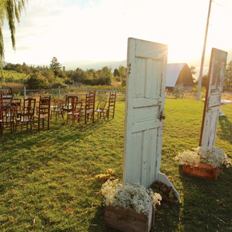 We are so lucky to have picked the beautiful Okanagan for our wedding, what we consider the hidden gem of BC, let alone Canada. Otherwise, we would not have met your amazing soul, Yuriko, on our journey to “forever”. 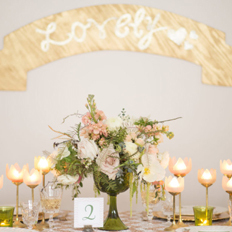 "We honestly do not have the words to express how happy both Jason and I were about the decor. It was absolutely stunning. My guest still cannot stop talking about it. Not to mention all my friends and family in Toronto were shocked with the pictures my guest posted. You honestly gave us our dream wedding. From day one, you have always been so supportive and helpful. You honestly are one of a kind. You have such a sweet soul and kind heart. " "Thank you from the bottom of our hearts for everything you did for the wedding. It was beyond perfect. The ceremony looked so lovely and the ballroom was just amazing. 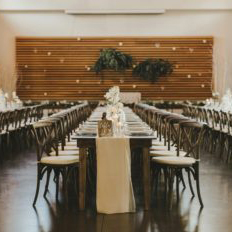 I stole a quick glance at the reception room just before the ceremony and just about melted. 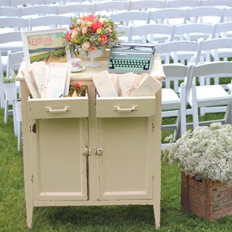 It was elegant and tasteful and I adored the LOVE letters at the head table. We had so many comments about how lovely everything looked and people asked if I had chosen the decor. You were bang on with all your choices matching my tastes! 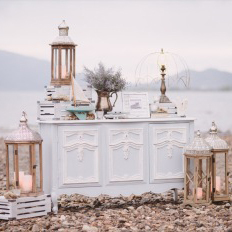 I loved the centerpieces and loved the dresser on the roof. It was just amazing! The cake/candy table was amazing and I can’t say enough how perfect it was!!! You captured what we asked for wonderfully. So thank you again!" "Soooo …. Did anyone ever tell you, you know how to run a f***in wedding!! Hahaha sorry. I’m a classy girl at heart and a sailor in the mouth. But really, honestly. I’ve been up the last two hours day dreaming about my own wedding…. That happened 2 days ago. I am vibrating…. Can’t even contain my excitement over what happened. What an absolutely wonderful, beautiful, AMAZING wedding!!!! You….. Ahhhhhh. Hope you’re hearing my voice when I say, from the absolute bottom of my heart, you are exquisite. Our guests loved the Falcon Punch, the flip flop signs, the plates, the gorgeous displays, the guest book set up….. I think they may have even liked the set up for the reception better than they liked us!!!! Hahaha. Seriously, SUCH an amazing idea to have everyone sitting together in one long table. Extremely original. No one will ever forget it, as everyone kept telling us how much it meant to them that we were all together no matter what. Wonderful symbolism for the day! Thank you, thank you, thank you. Even though I may have been *a little / a lot* worried about the rain, as soon as I heard your voice, I instantly felt calm and secure. I knew you were going to make it a lovely ceremony, and it was so unbelievable. Such a special day inside the pyramid. Max and I have always relished in once-in-a-lifetime experiences – whether that be adopting 10 pets or travelling the world for months on end – we always love a good laugh and a great surprise. Thank you, your lovely staff (such cute shirts for Vintage Origami btw!!) 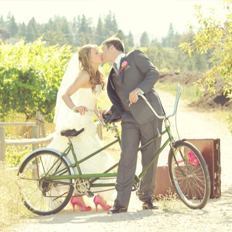 and of course beautiful Summerhill for making it the best day, in the most romantic place I’ve ever been." "I would need to invent new letters to create new words to be able to adequately describe my gratitude to you and your team. Working with you this past year has been an absolute delight. Your spirit, passion and drive inspires me beyond belief. I feel as though I have found a forever friend in you! Thank you for making our wedding day dreams come true – it was a fairytale!" "It’s been a year since our wedding and as we look back we are so thankful to everyone who came together to celebrate our special weekend. Thank you so much for helping us make our events have a unique and personal touch. Because of you we had a million dollar wedding – but without a million dollar budget! Thank you so much for all your support through the process!" “From the bottom of our hearts, Thank you. Walking down the aisle with Lisa, we were overtaken by emotions. 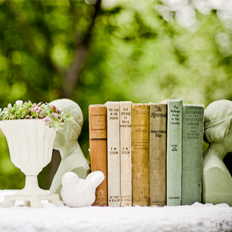 It did not stop us from feeling amazed by beauty of decor, softness and it’s beauty. The great room looked beyond amazing. It was all and much, much more. All your perfect touches were noticed as we made sure to go back and look at each one again and again. All the guests commented that this was the most beautiful décor they ever seen. "Yuriko went above and beyond for my wedding. She is very sweet and made me feel so special, like I was her only client. She took the time to read my lengthy emails and responded right away. So many brides think they can decorate a wedding themselves, and I was one. Looking back, having Yuriko handle the decor for me was one of the best decisions I made. I wish I lived in Kelowna so vintage origami could decorate all of my life’s greatest moments. If you have a chance to book her do it! You will regret it if you don’t." “This wedding could not have happened without you. Every vendor we chose was on your recommendation and we couldn’t be happier with all choices. You are so incredibly talented; it was an absolute honour working with you. You made every crazy idea and pint rest picture turn into a reality. 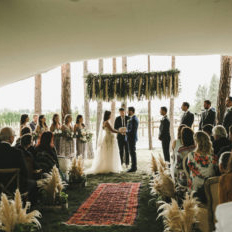 Everyone who attended the wedding couldn’t stop gushing about decor. 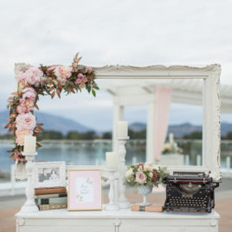 "Finding a Vintage Rental Company to do our wedding decor couldn’t have been more tailor made for us. Kris and I both value our families so much. It was so important that our special day involved everyone past and present who have and had such a positive loving impact on us. Yuriko’s talent and her entire creative process captured everything we wanted. When I pulled up to the ceremony I was stunned at how perfectly she had gotten our us. Each location at Summerhill was better than the next. “Thank you” so much for everything Yuriko we loved our day and what made it extra special was being able to congratulate you on all of your hard work personally. Job well done!" -Kris and Colleen, Calgary, A.B. "We are beyond lucky to have found Yuriko as our decorator…..our wedding was stunning and we have Vintage Origami to thank. Yuriko captured a dream and made that vision a beautiful reality. From our very first meeting to our many texts, emails and calls she has been an absolute pleasure to work with. 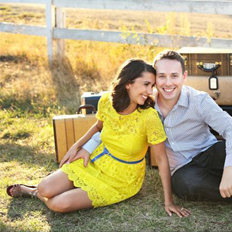 As an out of town couple having the confidence and complete trust made the planning process so enjoyable and seamless. Yuriko’s amazing creativity, attention to detail, personalized touches truly made our day magical. 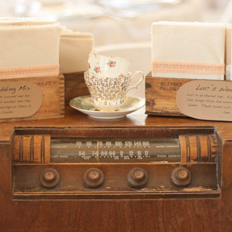 So many special elements were included in our lovely vintage wedding. 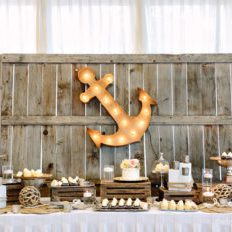 From the surprise floating teacups on the ceremony arbor to the nautical themed scotch/cigar bar to the “you had me at ahoy” custom buoy to the vintage scales covered in cupcake heaven to the incredibly sparkly chandelier adding a special elegance. So much time, thought and originality made our special day one we will cherish and remember forever. Words will never be able to express our gratitude. Yuriko – you are a true talent with the biggest heart any couple would be extremely lucky to have you be part of their wedding day." "We were so lucky to have Yuriko of Vintage Origami design our event. 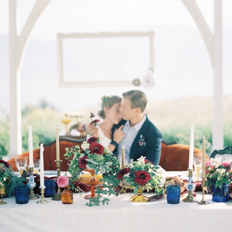 Yuriko was so much more than a wedding designer – she was an absolute dream to work with! Every step of the way, she made us feel like we were her top priority, taking all of our ideas into account and turning them into magic. She was always available both by phone and by email, yet we never felt pressured or stressed when talking with her – instead she eased our worries, and make the wedding planning seem much much carefree than I’m sure it otherwise would have been. 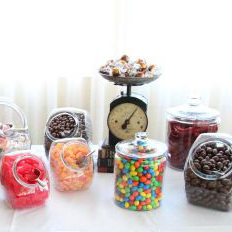 Darryl loved planning the candy buffet, or his “feature table” as we called it, and Yuriko contributed about 50 lbs of candy for the buffet and room decor, which our guests adored! Its those little touches that made the whole experience even more enjoyable. 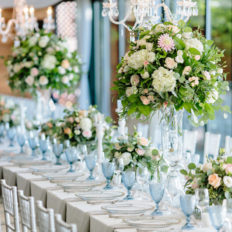 Walking into the Harvest Golf Course for our reception made me feel like I was in my own personal fairy tale – my favorite colours, the vintagey theme done with elegance, the macarons displayed in beautiful vases for our guests, and the gorgeous flowers adjourning each table. We felt we had an absolutely beautiful wedding, and we have Yuriko to thank for this – we couldn’t recommend her more highly!" "Thank you so much for making a fairy tale come true! 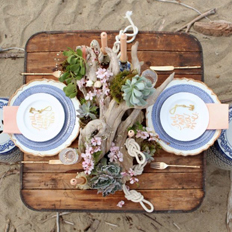 Darrell and I were so happy to find a vintage rental and decor company for our wedding. 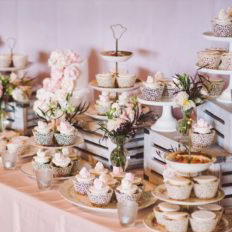 Your fun, elegant and shabby chic style made our candy bar, centerpieces, guest signing table and gift table unique and unforgettable. 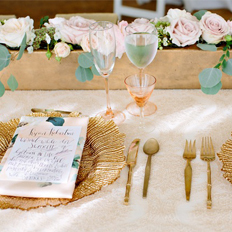 Your props were excellent conversation pieces, which helped break the ice between guests. This, in turn, added to the excitement and to the fun of the evening! 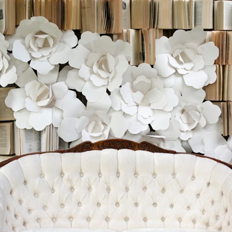 We are also very happy that you incorporated our personalities into the decor by customizing our reception venue. We loved that you took the time to make our special signage just for us! Our guests are still talking about it! Planning a destination wedding can be difficult. But Yuriko, you relieved much of the burden associated with the long distance planning. 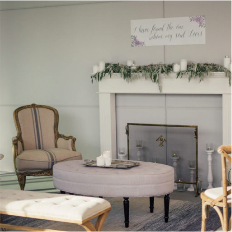 Your genuine desire to help shined through in all of your work; through your detailed emails, your thoughtful recommendations or your eye for detail while decorating the venue. It was a huge relief to have such a perfectionist oversee all the final details before our guests arrived at the hall. Thank you for all of your wonderful and creative ideas. You really went above and beyond for us and we are forever grateful!" - Michelle & Darrell, Ottawa, O.N. "THANK YOU SO VERY MUCH!!!! Jared and I were SO over joyed to find a vintage rental company in Kelowna. You make wedding planning so easy!! You really helped us create the vision for our day and bring it to life! Our day was certainly SPECTACULAR. You have been such a joy to work with and I really hope we keep in touch :) WE LOVED the photos you sent our way. It’s truly SO hard to believe that that was our day. They look like they are straight out of a magazine." Brooke & Jared, Vancouver, B.C. As seen on the Style Me Pretty blog featuring the wedding of Jennifer and Jeff, Saskatoon, S.K. As Jeff and I celebrate our one year anniversary today, we are looking back on all the fond memories of that day. We just wanted to send a quick “Thank You” for making our day so special. We feel so blessed to have had you and Erik as a part of our wedding. You two made it absolutely beautiful!! - Christine & Richard, Kelowna, B.C. 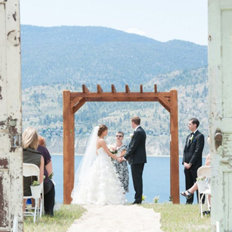 - Brittany & Ryan, Summerland, BC.